The Pig is the twelfth of all zodiac animals. According to one myth, the Jade Emperor said the order of the animals in the zodiac would be decided by the order in which they arrived to his party. Pig was late because he overslept. Another story says that a wolf destroyed his house. He had to rebuild his home before he could set off. When he arrived, he was the last one and could only take twelfth place. – Storytelling: Listen to the legend of Nien, hear about the Chinese zodiac, learn the many ways we celebrate the 15 days of the Lunar New Year, and discover the traits of 2019’s Pig. – Parade: Families can join the parade to the NY Chinese Scholar’s Garden (weather permitting) and hear cymbals, drums, and pop-it firecrackers scare off evil spirits. – Food: Enjoy a tasting of traditional foods like dumplings, spring rolls, and chrysanthemum tea. 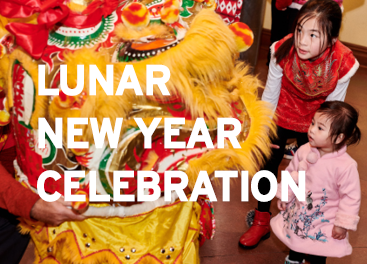 Wear red and gold when you come to Snug Harbor to celebrate Lunar New Year with us! Gung hay fat choy! The main event space in Building P is wheelchair accessible, as are the restrooms. Some areas of the NYCSG have limited access for persons with mobility issues. The entire event will take place in Building P if the weather does not permit entry to the NY Chinese Scholar’s Garden. The Lion Dance is sponsored by Thomas Paulo and Dr. Ronald Altman. ← Spotlight Theatre Presents: Mamma Mia!